It’s that time of the year when one school year is coming a close, and we are preparing for the following school year. If you have a little one at home, this may mean it’s time to find them a preschool. But, where do you even start? Relax! Choosing a preschool for your child isn’t as hard or as overwhelming as it may seem to be. The secret to finding a good preschool begins with preparation and knowing what you’d like to see in a preschool and knowing what you’d like your child to gain from his preschool experience. I’ve put together some simple tips on ways you can choose the right preschool for your child. No two preschools will offer the exact same things, so the important things to do is check out 2-3 schools before deciding on one. This gives you the chance to see many different settings, curriculums, and classrooms. Research, research, research. You’ll want to look for a few specifics that will work for your family BEFORE you call for a tour of the school. Is it part-time or full-time program? Are they gold star accredited? Ask friends/family for recommendations. Sometimes the highest recommendations for good preschools come from word-of-mouth. 2. What are some things to look for? You’ve narrowed down the school and now you’re ready to tour! You get to the school, but what do you look for? Many preschools are going to brightly colored with child art work hanging on the wall (I hope! ), so you want to know what you’re specifically looking for beyond the surface. Ask the teacher if they have a first-aid kit. Many teachers are required to keep them in a locked cabinet, so you may not see it at a glance. Does the classroom provide a variety of activities or “centers”? Is student art work displayed? You’ll be leaving your child in the hands of the teacher, so you want to know as much about him/her as you possibly can. The teacher is going to be your partner in teaching your child in these developmental years and you want to make sure the teacher is someone you can trust and that your child can grow to love. What are the teacher’s credentials? At minimum, I would require a teacher have an associate’s degree and formal training in early-childhood education. What are the teacher/student ratios? The less students they have in a preschool classroom, the more opportunities for one-on-one interaction with the teacher. How does the teacher individualize instruction? How do they adapt the curriculum for students who are well ahead or student who may need extra help? How does she keep you informed on your child’s progress? Does she make the kids feel welcome? Is she warm and inviting? Does she talk to the kids patiently? Talk to the teacher about the typical classroom schedule. Meeting the teacher is one of the most important aspects of choosing a preschool. If she answers your questions warmly and attentively, and you are happy with the feeling the teacher gives you, then it’s safe to say you found a good fit. Here’s a quick checklist of things you’ll want to talk to the director about when you visit. How does the school keep the parents involved? What’s the school’s discipline policy? Remember, choosing a preschool does not have to be an overwhelming or stressful task. Finding the perfect fit is easier when you go into the process prepared and ready to ask questions. Teachers love knowing that you are ready to partner with them in your child’s education, so ask as many questions as you can. Most importantly, make sure the school and teacher make you and your child feel warm and welcome. When you find the right preschool, get ready to embrace your child’s greatest adventure! Thanks for posting these things that I should check for when choosing a preschool program for my child. Asking about first-aid kits that are accessible to teachers would be an important question for me to ask. I want to be sure that my son would be able to get the medical attention that he needs that his teachers can provide if he’s hurt while at school. I’ll also check how safe the school environment is and if the outdoor play area has adequate shade so that he won’t get overheated when he’s outside. Thanks for posting this! You’re very welcome! I’m glad you find it helpful! My three-year-old is my oldest child and so I am brand new to this whole preschool thing. I definitely appreciate your visit checklist, because I will make sure to ask those questions when we go and visit different programs. However, I assume that most programs would require a child to be toilet-trained, but what if he sometimes has accidents? These are some great tips, and I appreciate your advice to do a lot of research before you tour a preschool. My husband and I just moved into a new area, and we want to find a good preschool for our daughter. I’ll definitely make sure to do plenty of research before I even set foot in the building so I can narrow the field of my search a bit. Thanks for the great post! Yay! I’m so glad you found this a helpful resource! Thanks for commenting and letting me know 🙂 Searching for preschools can be overwhelming and daunting, so just take your time and research! Good luck! I think that it is important to look at location when choosing a preschool. That way you can be near your kids. Thank you for the help. My wife and I are about to start looking for a preschool for our daughter to go to. I appreciate the checklists. I was not entirely sure what to look for especially when visiting the school. I definitely want a school that involves the parents, as you mentioned. What level of involvement should I expect? Hi Justin! I’m so glad you found this list helpful. I would definitely look for opportunities where parent’s can attend holiday parties, field trips, volunteer (I use volunteers to even help me with Scholastic book orders and such! ), and maybe organizing food drives during Thanksgiving or PJ drive during Christmas. I know some preschools even let parents sign up to come read a book to the class one day. Just look for the school to be an open door where you feel like you and your wife are welcome anytime. I know a lot of kids go to preschool now. I think it really helps them be more social and I think it also gives them a head start. I agree that if you are thinking about putting your kid into preschool that you should do a lot of research because you want to put them in the best position to succeed. You make a really good point about doing your research before getting too comfortable with one of your options. I didn’t even know that there are associations available to give an accreditation. In fact, I think I’ll be going on the NAEYC website tonight to help me find a preschool for my daughter. Hopefully this will help me narrow down my options quickly! I like what this article recommends about considering who the teacher is. It makes sense that keeping the teacher in mind when looking at preschools could be good to make sure you’re leaving the kid in the hands of somebody you trust. It’s something to keep in mind for my kid because I want to make sure he’s happy at the school. I agree that an important part of the research process is to go out and meet the teacher! It helps to find out if the teacher’s personality will click well with your child. Hopefully, you find that you and the teacher share some similar values as well. It really helped when you talked about how you can ask friends and family when looking for a good preschool for your kids. I can see how anyone looking into this would want to make sure they consult with those who have experience with preschools and care about getting you the best. As I see it, taking the time to plan ahead and to read online reviews can help you find a facility that has a great program for the needs of your kids. I agree with you in that it is important to ask your friends and family when choosing a preschool. It makes sense that asking those that have experience with preschools in your area can help you get the best referrals. Personally, I would want to make sure I read online reviews and compare several schools to find the best program for my son. Thanks for the great tips for finding a preschool. I like how you said to do research before doing anything else. We would definitely want to take our two sons to a school that is state-licensed, since it would be safer! 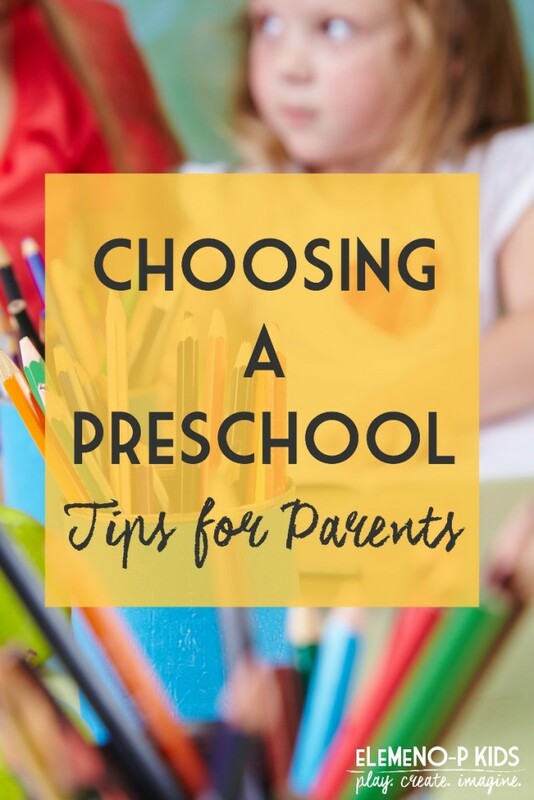 It’s good to know that when it comes to choosing a preschool that there are some things that we need to look for when it comes to choosing the right one. I like how you mentioned that we need to see if they have age-appropriate books and toys for my kid. This is something that I will keep in mind when my kid gets to that age. I am so glad you found this post helpful! Good luck finding a great school! Thanks for these tips for finding a preschool. I’m really glad that you mentioned to research the place beforehand and to learn if they are state-licensed. That being said, I think it could be good to research more about the licenses that the preschool can receive. It seems like a great way to understand more about their credentials and if it’s the right fit for your child. Hi Taylor, you’re right. I work in Ohio here in the US and all state-licensed childcare centers have a baseline that they are permitted to follow, otherwise they don’t get their license. Now, above that, they also have Step Up To Quality star ratings which means your school can go 1-5 steps ABOVE the baseline license. I don’t know if all states have this system, but most licensed preschools have the same baseline credentials. I liked that you had mentioned that when it comes to looking for a preschool that it can be important to make sure they’re licensed to take care of and teach your child. My wife and I have been trying to get our 4-year-old into a schooling program because he is really smart and would benefit from being taught earlier. We’ll have to start looking around for licensed preschool programs in our area where our son will be able to learn a lot more and get the socializing he needs. I love your tips for finding a preschool. My daughter is getting old enough for this soon, so I want to start looking at potential schools. I’ll take your advice and write out a checklist of what I want to ask the director, when I go. Thank you Silas! I wish you luck on finding the perfect preschool for your daughter. Reach out if you have any other questions! Thanks for the tip about finding a preschool that will adapt their curriculum to a child’s needs. It would make sense to find somewhere that will match your child’s individual needs. My husband and I have both started working full time and we need somewhere for our child to go. When we find a preschool for them, we’ll have to check their curriculum. Yes, curriculum is so important! So glad you found this post helpful! Good luck in your search.